Welcome to my blog! 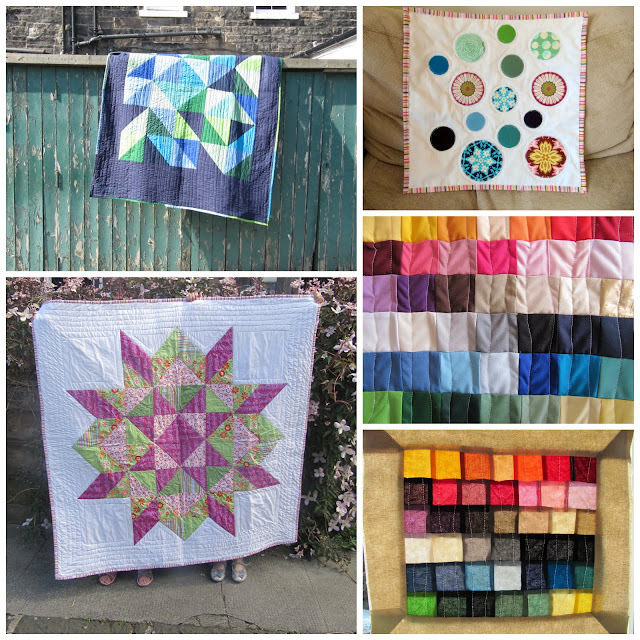 I'm not usually a very prolific maker, but here's what I got up to during May - it includes my first two full-size quilts. This is a prototype for a quilt that I would like to make. It's my first attempt at paper piecing (except for an abandoned EPP crab) and it's supposed to be a dandelion seed although I think it looks rather like a parsnip! That's partly because I'm practicing on spare scraps of fabric rather than the ones I might actually use, and partly because, well, it just looks like a parsnip. It's also my first serious attempt at free motion quilting - I've realised that I don't need a special foot (though I'm sure it would help) or to drop the feed dogs. I've just raised my usual foot, and set the stitch size to 0. The quilting is very ropey, but I still love that effect. love the siblings together quilts - they are fab! You had beautiful finishes for this month! The Siblings Together quilts are wonderful. FMQ is so fun and versatile - I feel like it is a skill where there is always something new to learn. Great projects, FMQ is fun, i have been having a go for a while it takes loads of practice! It does look like a parsnip! You got so much done this month. Beautiful work! The siblings quilts are lovely and I especially love the little feet peeking out underneath! Wow - your quilts are really beautiful! And your new project looks fun. Hi - I've found you via the small blog meet. Loving your swoon! They're beautiful! Especially the doll quilt...I love the circles. Hello to you too! I'm stopping by through the linky just to say how wonderful your work is! I love your quilts, thank you so much for sharing all the pictures! You've been busy in May! What fabulous finishes!! I love your dandelion seed, it's really light and floaty like a dandelion seed should be.